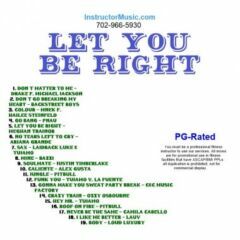 Meghan Trainor is back with a big radio hit called “Let You Be Right” and we’re featuring it on the new workout mix. But we kick it off with Drake’s new one called “Don’t Matter To Me”. Other highlights include “Mine”/Bazzi, “Roof On Fire”/Pitbull, “I Like Me Better”/Lauv and “No Tears”/Ariana Grande. We also got a jump on the brand new Justin Timberlake song “Soulmate”. This mix is PG-Rated.